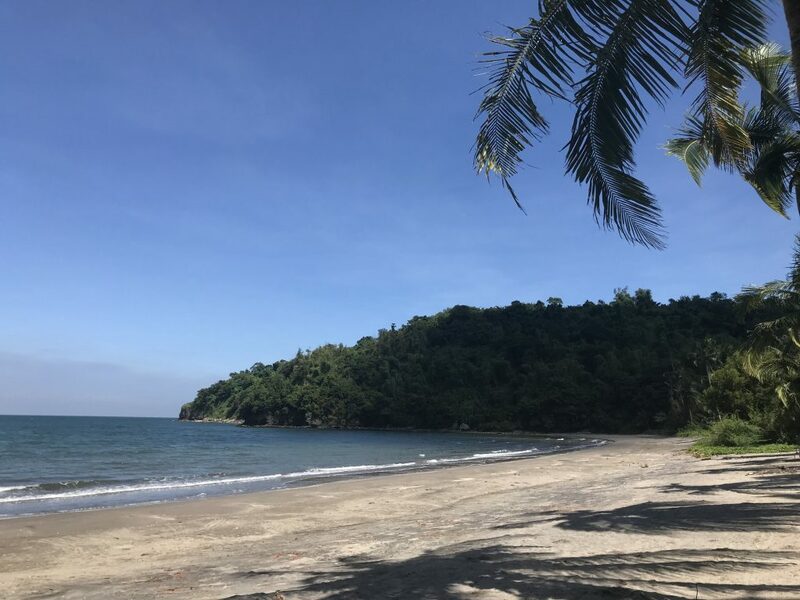 Paniman Beach is located in the municipality of Ternate, Cavite Province. I only really know where this place is because a good friend of mine has a holiday house nearby in Maya Maya in Batangas. I have been driving to Maya Maya from Manila since about 2009. Most of the time we have taken the coastal road and passed through Cavite. Previously I had not really thought of Cavite as a place synonymous with being a tourist destination. 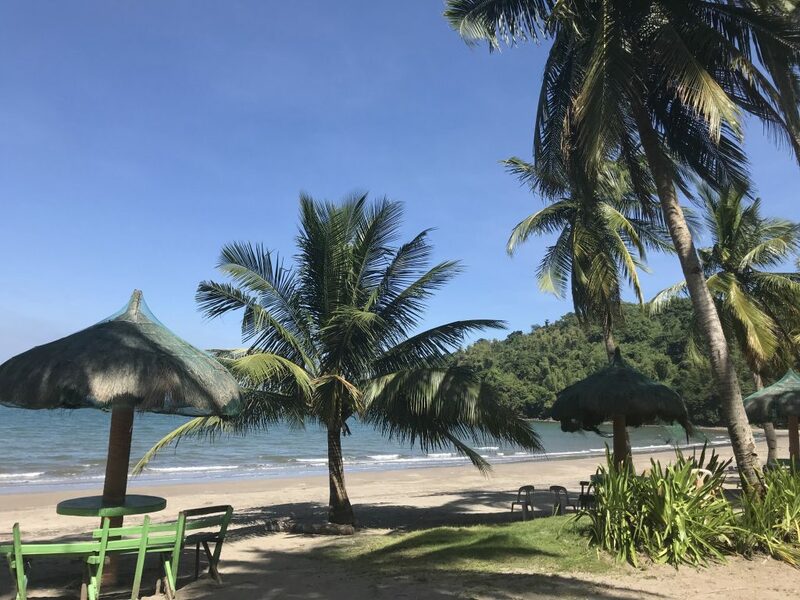 I didn’t really think you will find the best beach resort in the Philippines in Cavite. Most of Cavite’s beachfront bordering the outskirts of Metro Manila (NCR) is reclaimed land, and full of fishing villages. This is far from an ideal place to take the family for the weekend, or even a day trip from Manila. The other problem that you have with Cavite is that it’s the most populous province in the Philippines. Most of the time when you drive through there, it is full of people, motorcycles, tricycles, jeepneys, cars, trucks and buses and to be honest, is a complete nightmare. I’m usually trying to leave there as quick as I possibly can. As mentioned on my Puerto Azul page, I had driven past Puerto Azul golf and country club on a number of occasions and was quite curious about the place. All that I knew about the Puerto Azul was that there was a golf course that has been designed by Gary Player and that it had views overlooking Manila Bay. Unfortunately, it is one of those places where you see it often, and you intend to go and check it out one day. However, for some reason or another, you don’t. One day, on the way home from Maya Maya in Batangas, we decided to finally stop and have a look. As we were driving through the housing estate, we saw a sign that said Paniman Beach. Although we weren’t overcome with excitement, the word beach sparked some interest. 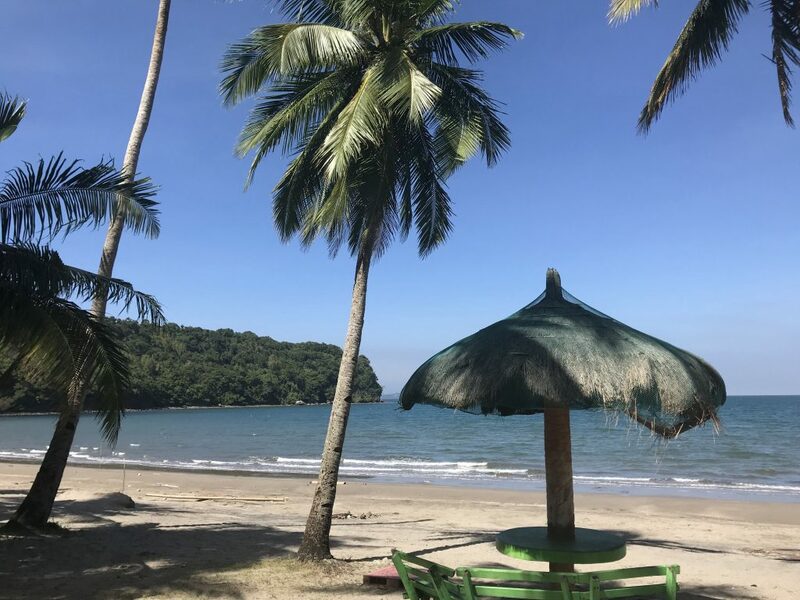 Although we were meant to be going to Puerto Azul golf and country club and the Caysubic Clubhouse as we were told, we followed the signs to Paniman Beach. When we first arrived at Paniman beach, it looked like a normal provincial Filipino beach. There was hardly anybody to be seen and there was only one vehicle parked in the car park. As we approached the beach, we could not believe what we saw. It may not have been the best beach resort in Cavite, but it certainly wasn’t the worst either. It was actually clean and the sand was soft and a typical volcanic greyish/gold colour. Beautiful palm trees lined the beach and there were also abandoned kubos (huts) that lined the beach. As I looked out across the cove, I couldn’t believe we were only about 60kms from Manila! There was a small kiosk nearby that was manned by two caretakers. We tried to glean some info from them but they didn’t speak very good English. Therefore, we weren’t able to get too much information from them about this place. 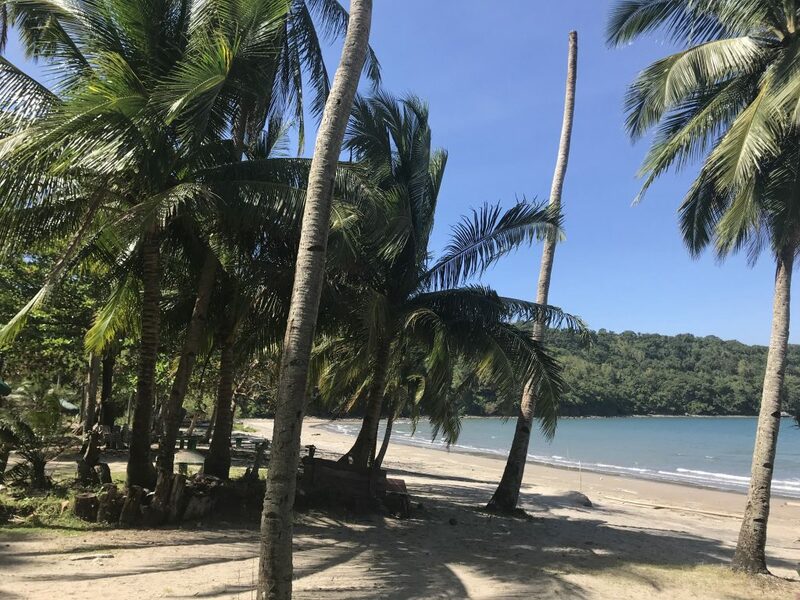 However, it was pretty apparent that like neighbouring Puerto Azul and Caysubic, this was a totally abandoned beach resort. We didn’t have too much time to investigate the place much further. However, there was an area where it looked like there was, or had been, some form of accommodation. Needless to say, there isn’t too much point visiting this place unless you were totally self-prepared. You may be able to get away with sitting on the beach for a couple of hours, but not much more. We were not approached to pay an entrance fee while we were there. However, I’m sure if we hadn’t arrived looking to settle down, the caretakers would have approached us to leave or stay (with a small fee). You can check out more by watching my short vlog. So if you’re feeling a bit adventurous, you can check out a nice beach 60 kms from Manila. It may be totally abandoned, but this might be the place for you. Just tell the guards at the main gate you want to have a look at the golf course. Then they may let you through as easily as they did us. Fridays at Paniman Beach is a totally abandoned beach. This is probably the best beach I have seen as close to Manila as it is. Its still boggles my mind how a place like this can lie here totally under-utilized, a barren wasteland. Paniman Beach is certainly not the best beach in the Philippines, but it would have to be the best I have seen so close to Manila. There seem to be some caretakers here as the beach was actually pretty clean and tidy. Paniman Beach is about 65kms from Makati via the Cavite Coastal Rd. There is fairly clear signage for Puerto Azul so its pretty easy to find using Waze or Google Maps. I wouldn’t recommend taking a bus to get there. I haven’t seen too many buses or even jeepneys on this part of the route. The other problem is getting around the compound. Due to security, entry may be denied unless you have a private vehicle. If you want to go and check this place out, you can get into the compound by just telling the guard you want to look at the Puerto Azul golf course. There is ample signage in the compound to guide you and you can also check out Puerto Azul golf course while you are there. However, this is a totally deserted area so its worth a look, but don’t plan on spending too much time there.